After a major loss, most homeowners know they need to immediately call their agent but what next? 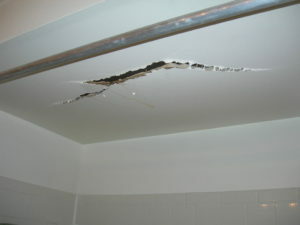 The first step to remediation is obvious; get the water out of the basement or tarp the hole in the roof. But what about the minor losses? The first step can be a lot less clear. Should you call your agent and file a claim? Is this even an insurance matter? Should you call a plumber or a roofer and risk paying a large amount out of pocket? We recently had a customer in this exact situation. Her garage roof was nearly collapsed in after a recent string of severe storms. There were no obvious signs of water damage but the ceiling in the garage was cracked and almost hanging off. She was not sure what to do. Her agent said insurance wouldn’t cover the damage in every situation, i.e. old age but it would be covered if it was damaged from the storm. Since there were no signs of water damage and the homeowner had only recently moved into the home, she really wasn’t sure and didn’t want to file a claim unnecessarily. When she purchased the home, the seller gave her a series of warranties. Thinking maybe one of the contractors who worked on the home might have a better idea, she called. It turns out, she could not claim this as a warranty issue because warranties only cover a craftsmanship issue and or a manufacturer defect. Once again, not truly knowing the source of the problem made it extremely difficult to know which next steps were the best. The homeowner did not want to pay a repair fee out of pocket if the contractor came out and deemed it not to be a problem in craftsmanship. Luckily, for this homeowner her agent referred her to us, a general contractor. We’re kind of a one-stop shop when it comes to residential losses of any size. Most contractors specialize in one thing albeit minor handyman work, roofing, painting, flooring, ect. A general contractor specializes in all of this which is a true benefit to the homeowner as they’ll never have to research and schedule a million different trades for their project. We do all the work under our company so the quality of work remains the same. We were able to come out and asses the garage damage, not only find the source but also do the repairs. The homeowner did not have to worry about paying a service fee to a contractor who may only specialize in drywall and the damage be a storm related issue, therefore still needing to pay someone else to come out. Furthermore, even if the other contractor could assess the damage, he may not be familiar with residential insurance claims as most are not. It expedites the process if the contractor doing the repairs uses Xactimate, the estimating software insurance adjusters use and understands how insurance work is done as it differs drastically from retail. Directing your homeowner to the right person after a loss is one of the most overlooked yet important steps for both major and minor losses.